Dr. A. Chakrapani, Chairman, Andhra Pradesh State Legislative Council & NRI Committee inaugurated UK Telugu Association (UKTA), in the Bharatiya Vidya Bhavan, West Kensington, London. On this occasion the eminent Carnatic musician Dr. M. Balamurali Krishna was felicitated by the chief guest Dr. Chakrapani. 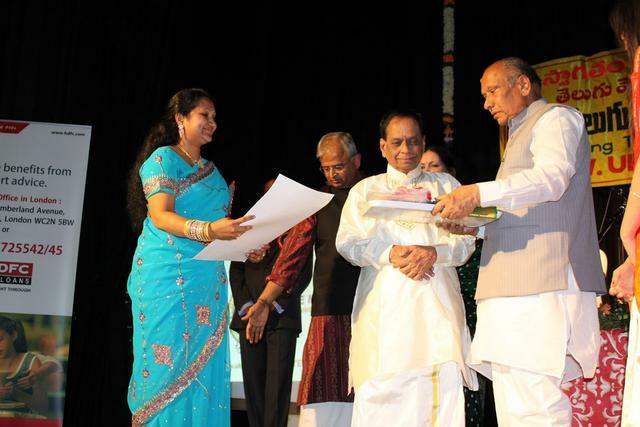 The citation hailed Dr. M. Balamurali Krishna’s contribution to music, both as a singer and a composer and listed his achievements as the recipient of various awards including the prestigious Padma Vibhushan. The UKTA is essentially a platform, for bringing together non residents Indians from all over Andhra Pradesh and those who speak Telugu, so that they can share ideas and opinions and mutually support each other. The main focus of UKTA will be on students and IT professionals. There is no membership fee and anyone can join through its website, www.uktas.org.uk. Dr. Chakrapani conveyed the message from Mr. K. Rosaiah, Hon. Chief Minister of Andhra Pradesh, expressing his happiness at the formation of UKTA and assuring the support of the state government. The Chief Minister expressed his desire that the government would work for the benefit of the Telugu people living away from the motherland. Dr. Chakrapani in his speech said that he was well aware of the problems faced by Telugu’s living abroad and that he would ensure they receive maximum support from the state government back home. He also said that his government would provide support in cultural, language and social spheres.